I tried to read everyone's rules very carefully and I think all 6 blogs allow multiple challenges. Everyone else is using bright summery colors but I seem to keep coming up with these soft colors. Maybe I'll brighten up in the next few cards. Ironic that I made this card today because it has been gloomy and it rained early this morning. 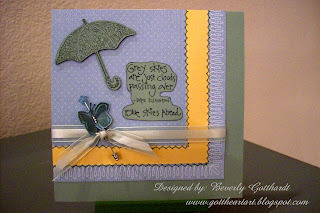 Supplies: Card Blank 6" X 6" cut from 12" X 12" piece of card stock, Stampin Up-blue swiss dot-Sweet Slumber Spealty Designer Series, gold textured card stock, Ink: CTMH-Z2125 Grey Wool, VersaMark, CTMH marker-Grey Wool, Stamps: Stampin Up-Font of You, PrintWorks-Q004 Caring Thoughts, CTMH-C1234 Simple Stitches, ribbon-Hobby Lobby, Flower Pin-Jo-Ann's, 3 tiny silver beads-Stampin Up Pretties Kit, pop dots. Very pretty card! And how clever to use the hat pin through the butterfly! Great job! Thanks for playing along with my challenge!! I love that little alphabet umbrella, what a cutie! I have to say that white loopy border goes perfect, like the blue skies ahead! Thanks for Playing with us at Pile It On! 6- that's impressive! And a great card to boot. Love the umbrella on the card. So cute! You are such the multi-challenge queen! Love your take on the Sunday Sketch! - Ann @ Pile It On! I love anything with a cute umbrella! Great job on all the challenges! Love the butterfly on the pin - so creative! And congrats on combining so many challenges! Thanks for playing along with us at Pile It On! Thanks for playing with us at Pile It On! this week! Can't wait to see more from you in the weeks ahead!